Australian angling stalwart, journalist and editor Shane Mensforth has taken delivery of his second Bar Crusher, a new 780HT. 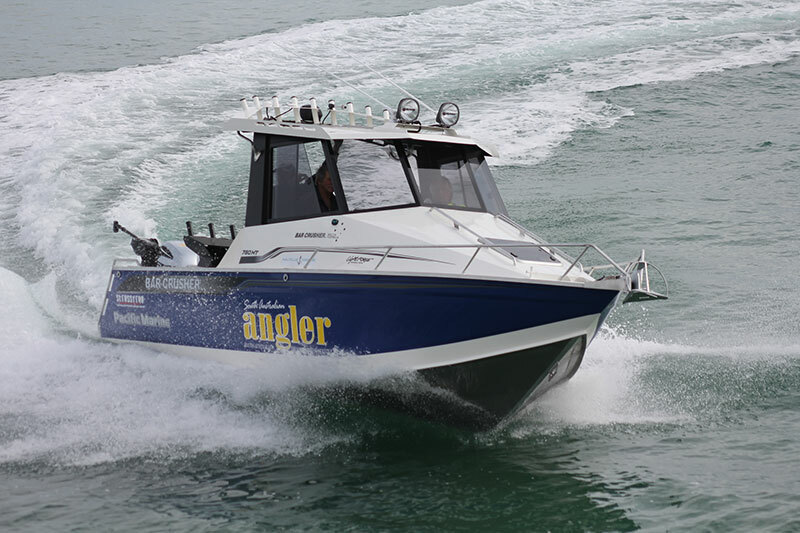 Powered by a Honda BF250, the big Bar Crusher has an upgraded 400L fuel capacity (280L + 120L), Garmin fuel monitoring system, 150L livebait tank, Stress Free anchor winch, Humminbird 1198 sounder/GPS, Canon Digi-Troll downriggers, Top Shot outriggers and a GME VHF radio and marine stereo. Mensforth said the 780HT would be his magazine’s – SA Angler – project boat for the foreseeable future. “Having owned many boats over many years, the most recent being a Bar Crusher 680HT [formerly 640HT], I just couldn’t go past owning another Bar Crusher,” he said. “At the time, the 680HT was the most ambitious package I’d put together in over 20 years… and the new 780HT tops that again! “Long-range offshore fishing for big tuna, kingfish and sharks is our core interest, so the proven performance of a Bar Crusher in even most trying conditions made the brand difficult to look past when considering another boat.